🔔 WONDERFUL WORDS (and Sounds): Ring Out, Wild Bells! In this traditional New Year’s performance, the ringers start by ringing out the old year right up to midnight, and then they all stop as a single bell rings the twelve o’clock hour — and then all the bells begin again, more joyously, ringing in the New Year. This performance is an example of “full-circle” ringing, with the bells turning through a complete 360º arc from upside-down on one side, to upside-down on the other. This makes it easier to control the full set or “ring” of bells as though it were a single instrument played by eight people. ❡ Ring out the thousand wars of old: If a special line or turn of phrase happens to strike you in one of our weekly poems, just copy it onto your homeschool bulletin board for a few days and invite your students to speak it aloud — that’s all it takes to begin a new poetical friendship and learn a few lovely words that will stay with you for life. ❡ Explore more: The Poetry Foundation’s website includes biographical notes and examples of the work of many important poets (including Tennyson) that are suitable for high school students and homeschool teachers. 🌘 THE MOON at the beginning of this week is a waning crescent — an increasingly good time for stargazing! Track the moon’s phases each month at timeanddate.com, and dial up this week’s constellations with your River Houses star atlas (riverhouses.org/books). 🗓 TODAY (Sunday, 30 December) — Today is the 364th day of 2018; there is only one day remaining in the year! Learn more about different kinds of modern and historical calendars on pages 351–357 in your River Houses almanac (riverhouses.org/books). ⬩ Today is the birthday of the Indian-English author and Nobel laureate Rudyard Kipling (1865–1936). MONDAY (31 December) — It’s New Year’s Eve! Ring Out, Wild Bells! ⬩ It’s also the birthday of the great French artist Henri Matisse (1869–1954). TUESDAY (1 January 2019!) — HAPPY NEW YEAR! 🎉 The Julian Calendar came into effect on this day in the year 45 BC. It was the principal calendar system used in the Western world for more than 1500 years (before it was largely replaced by the Gregorian Calendar). ⬩ Today is the birthday of Betsy Ross (1752–1836), who, tradition says, sewed the first American flag. 🇺🇸 Our homeschool poem-of-the-week for first week of January is Ralph Waldo Emerson’s frosty “Snow-Storm.” Print your own River Houses poetry calendar at riverhouses.org/calendars and follow along with us throughout the year. WEDNESDAY (2 January) — On this day in 1860, French mathematician and astronomer Urbain Le Verrier announced the discovery of Vulcan, a planet orbiting the sun inside the orbit of Mercury. No subsequent research has been able to confirm the existence of this planet. ⬩ Perhaps coincidentally, or perhaps not, today is also the birthday of the great science fiction writer Isaac Asimov (1920–1992). THURSDAY (3 January) — Today is the birthday of the great Roman writer and statesman Marcus Tullius Cicero (106 BC – 43 BC). ⬩ It’s also the birthday of English writer J.R.R. Tolkein (1892–1973), author of The Hobbit and The Lord of the Rings. FRIDAY (4 January) — Today is the birthday of French educator Louis Braille (1809–1852), the inventor of the famous tactile writing system for the blind. ⬩ It’s also the birthday of James Bond. SUNDAY (6 January) — Today is the birthday of the American poet Carl Sandburg (1878–1967). 🌎 EVERYTHING FLOWS: Guinea-Bissau in western Africa is one of our countries-of-the-week, so our Weekly World River is the Cacheu River, one of the longest rivers of Guinea-Bissau. You can chart its course in your River Houses atlas (riverhouses.org/books), and you can read more about it in the Cacheu River entry in Wikipedia or perhaps on your next visit to your local library. 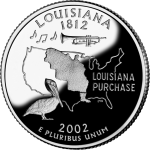 LOUISIANA (the 18th state, 30 April 1812) — The Pelican State. Capital: Baton Rouge. Louisiana can be found on page 573 in your almanac and on plates 40 and 142 in your atlas. Name origin: “Part of territory called Louisiana by René-Robert Cavelier Sieur de La Salle for French King Louis XIV” (almanac page 423). State bird: Brown Pelican (bird guide page 256). Website: louisiana.gov. 🇬🇳 GUINEA on the west coast of Africa. Population: 12,413,867. Capital: Conakry. Website: gouvernement.gov.gn (in French). 🇬🇼 GUINEA-BISSAU on the west coast of Africa. Population: 1,792,338. Capital: Bissau. Website: state.gov/p/af/ci/pu (U.S. State Department page, in English). 🇬🇾 GUYANA in northern South America. Population: 737,718. Capital: Georgetown. Website: parliament.gov.gy (in English). 🇭🇹 HAITI in the West Indies. Population: 10,646,714. Capital: Port-au-Prince. Website: primature.gouv.ht (in French). Not everyone gets to spend Christmas Day sitting around a cozy fire with family and friends. 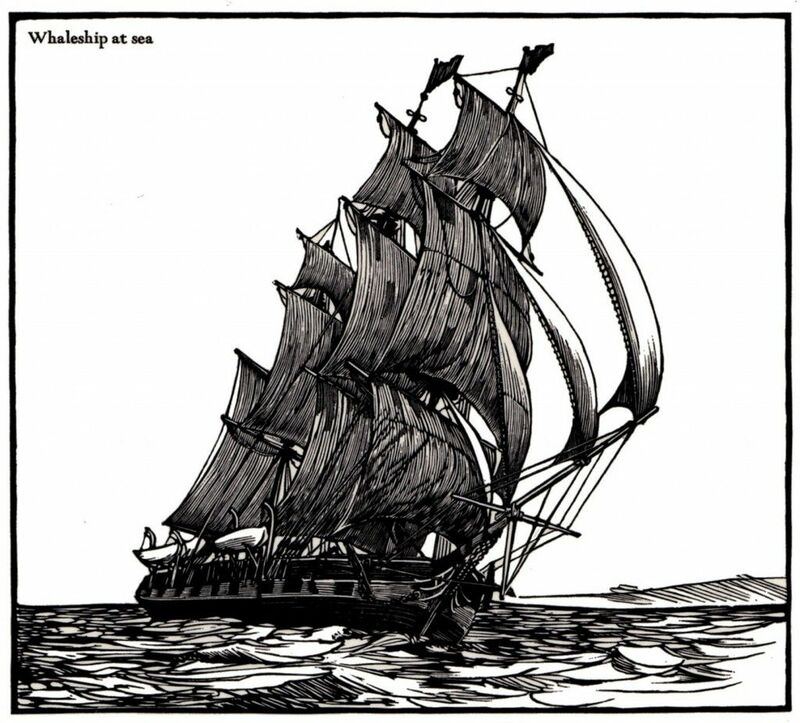 On this holiday, why not invite your students to remember all the hard working people who might like to be at home and warm, but who are instead out keeping our world running — police officers, fire fighters, hospital workers, snow plow drivers, and many others, including sailors at sea. ❡ Looking in the lexicon: Today’s little extract has some good vocabulary that your students can look up in your family dictionary (riverhouses.org/books): bulwarks, lank, cordage, fruition, boisterous, meads — wonderful words, every one. And what about “So to the Jews old Canaan stood, / While Jordan rolled between”? That’s from the Book of Deuteronomy in the Hebrew Bible — your dictionary will identify those proper names as well, and your atlas will help you locate the storied River Jordan in the Middle East. Merry Christmas to all! Is this the most popular poem in the world? Some people think so. (It’s our homeschool poem-of-the-week, so that’s means something.) Why not make an annual reading of it a tradition in your homeschool (if it isn’t already) — you can join millions of others who read it every year all around the world. 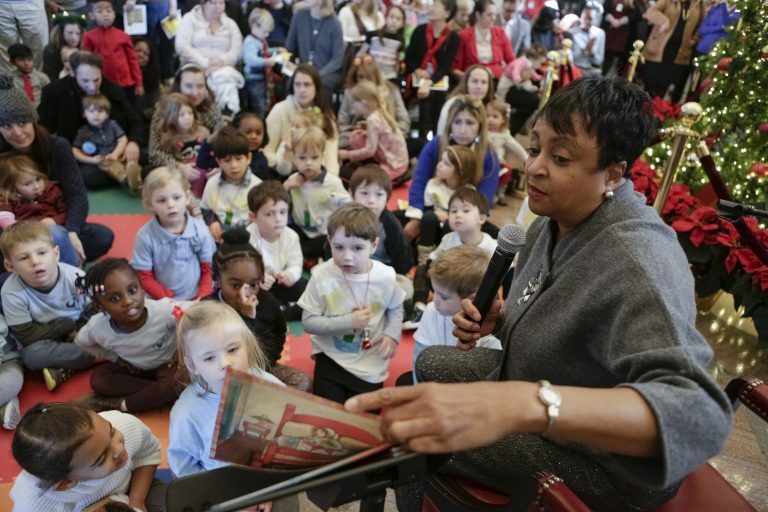 In Washington, the Librarian of Congress — first James Billington and now Carla Hayden — has given a public reading of the poem in the Library’s Great Hall nearly every year for the last two decades. ❡ Not a creature was stirring: If a special line or turn of phrase happens to strike you in one of our weekly poems, just copy it onto your homeschool bulletin board for a few days and invite your students to speak it aloud — that’s all it takes to begin a new poetical friendship and learn a few lovely words that will stay with you for life. 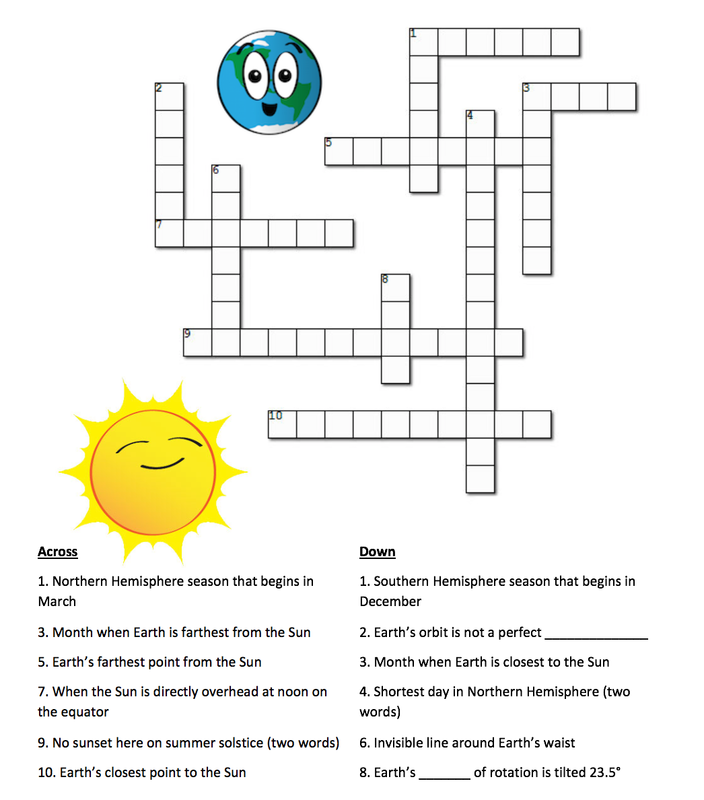 ❡ Here, said the year: This post is one of our regular homeschool poems-of-the-week. Print your own River Houses poetry calendar for the whole year at riverhouses.org/calendars and follow along with us as we visit forty-eight of our favorite friends. 🌖 THE MOON at the beginning of this week is gibbous and waning — a good time for moon watching! Track the moon’s phases each month at timeanddate.com, and dial up this week’s constellations with your River Houses star atlas (riverhouses.org/books). 🗓 TODAY (Sunday, 23 December) — Today is the 357th day of 2018; there are only eight days remaining in the year. Learn more about different kinds of modern and historical calendars on pages 351–357 in your River Houses almanac (riverhouses.org/books). ⬩ On this day in 1783, George Washington, the American Cincinnatus, surrendered his sword to Congress and resigned his commission as commander-in-chief of the Continental Army. MONDAY (24 December) — It’s Christmas Eve! 🎅 On this day in 1968, fifty years ago, Apollo 8 entered orbit around the moon, and its crew of three — Frank Borman, James Lovell, and William Anders — became the first humans ever to see the earth rise over another world. 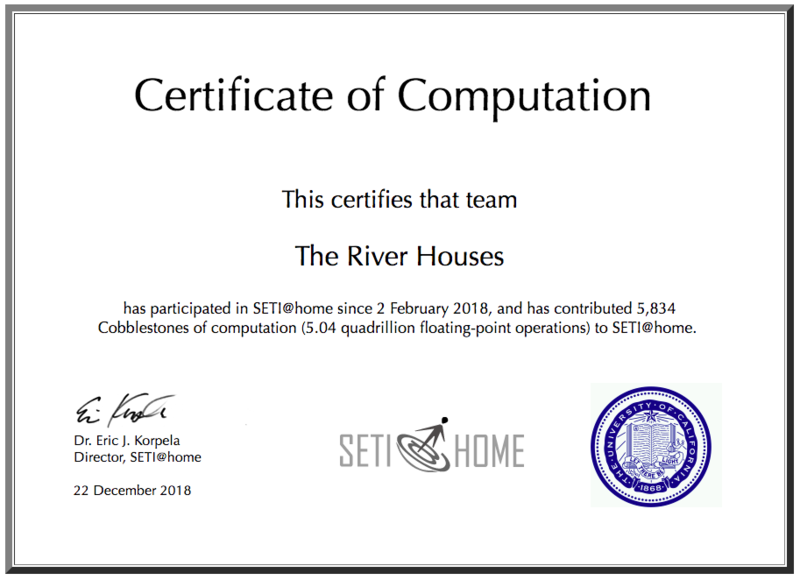 TUESDAY (25 December) — Merry Christmas to all friends of the River Houses! 🎄 Isaac Newton was born on this day in 1642. 🇺🇸 And on this night in 1776, George Washington led the cold and demoralized soldiers of the Continental Army across the freezing Delaware River to secure a decisive victory over Britain’s Hessian mercenaries at the Battle of Trenton. WEDNESDAY (26 December) — Today is Boxing Day in many Commonwealth countries 🎁, and St. Stephen’s Day in many others, and Wren Day in Ireland. ⬩ It’s also the birthday of the English inventor and polymath Charles Babbage (1791–1871), whose “difference engine” is widely regarded as the first mechanical computer. THURSDAY (27 December) — Today is the birthday of two of history’s great scientists: the German mathematician and astronomer Johannes Kepler (1571–1630), and the French chemist and microbiologist Louis Pasteur (1822–1895). FRIDAY (28 December) — On this day in 1895, the German physicist Wilhelm Röntgen reported the discovery of a new type of radiation never before encountered. Today we call Röntgen’s new radiation X-rays. SATURDAY (29 December) — On this day in the year 1170, Archbishop of Canterbury Thomas Becket was murdered in Canterbury Cathedral by followers of King Henry II. ⬩ And on this day in 1890, soldiers of the 7th U.S. Cavalry massacred 300 Lakota men, women, and children at Wounded Knee Creek, South Dakota. SUNDAY (30 December) — Today is the birthday of Indian-English author and Nobel laureate Rudyard Kipling (1865–1936). ❡ Toasts are a fun tradition for your family table. We offer one each week — you can take it up, or make up one of your own (“To North American dinosaurs!”), or invite a different person to come up with one for each meal (“To variety in toasting!”). Our current set of toasts are mostly taken from an old anthology called The Pic-Nic, a Collection of Recitations, and Comic Songs, Toasts, Sentiments, &c. (London, 1816). What will you toast this week? 🌎 EVERYTHING FLOWS: Guatemala is one of our countries-of-the-week, so our Weekly World River is the Suchiate River, which forms part of the border between Guatemala and Mexico. You can chart its course in your River Houses atlas (riverhouses.org/books), and you can read more about it in the Suchiate River entry in Wikipedia or perhaps on your next visit to your local library. ❡ Let the river run: Why not do a homeschool study of world rivers over the course of the year? Take the one we select each week (above), or start with the river lists in your almanac (pages 691–692), and make it a project to look them all up in your atlas, or in a handy encyclopedia either online or on a weekly visit to your local library. A whole world of geographical learning awaits you! OHIO (the 17th state, 1 March 1803) — The Buckeye State. Capital: Columbus. Ohio can be found on page 583 in your almanac and on plates 41 and 142 in your atlas. Name origin: “Iroquois word for ‘fine or good river’” (almanac page 423). State bird: Northern Cardinal (bird guide page 522). 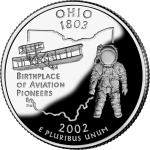 Website: ohio.gov. ❡ Explore more: If you’re planning a comprehensive unit study of one or more of the U.S. states, be sure to investigate the primary source materials for teachers available from the Library of Congress. And anything you and your students want to know about state flags, seals, mottos, birds, and much more, can be found at the helpful State Symbols USA website. 🇬🇭 GHANA in southwestern Africa. Population: 27,499,924. Capital: Accra. Website: ghana.gov.gh (in English). 🇬🇷 GREECE in southeastern Europe. Population: 10,768,477. Capital: Athens. Website: primeminister.gov.gr (in Greek and English). 🇬🇩 GRENADA in the West Indies. Population: 111,724. Capital: St. George’s. Website: www.gov.gd (in English). 🇬🇹 GUATEMALA in Central America. Population: 15,460,732. Capital: Guatemala City. Website: www.guatemala.gob.gt (in Spanish). 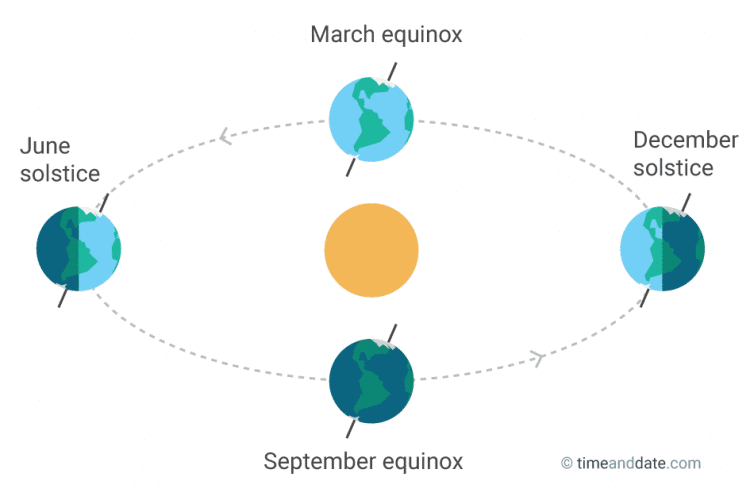 Tomorrow is the winter solstice in the Northern Hemisphere — the official astronomical beginning of the season of winter. But because the solstice is the shortest day of the year, it’s also traditionally called “midwinter”: the day of the least light and the greatest darkness. (Send your students to your family dictionary to confirm this special meaning.) In your homeschool this midwinter week, why not spend a few minutes introducing your students to Rossetti’s poem, which tells the Christian Nativity story, and to Holst’s magnificent musical setting. ❡ Explore more: The Poetry Foundation’s website (poetryfoundation.org) includes biographical notes and examples of the work of many important poets (including Christina Rossetti) that are suitable for high school students and homeschool teachers. 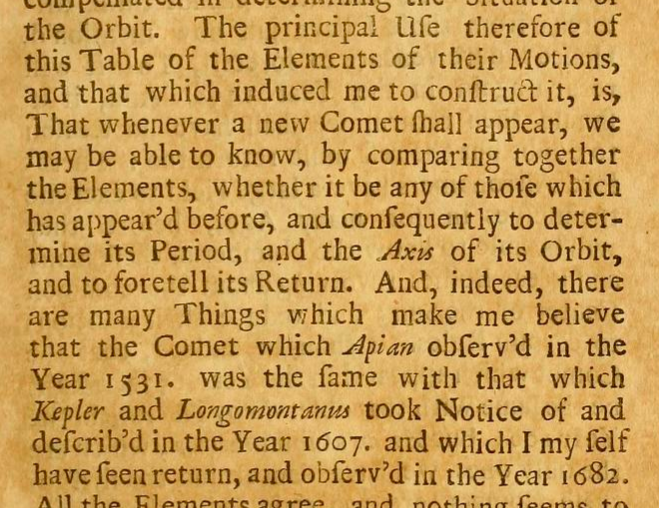 That’s the object we know today as Halley’s Comet, scheduled to return to the inner solar system again in the year 2061. 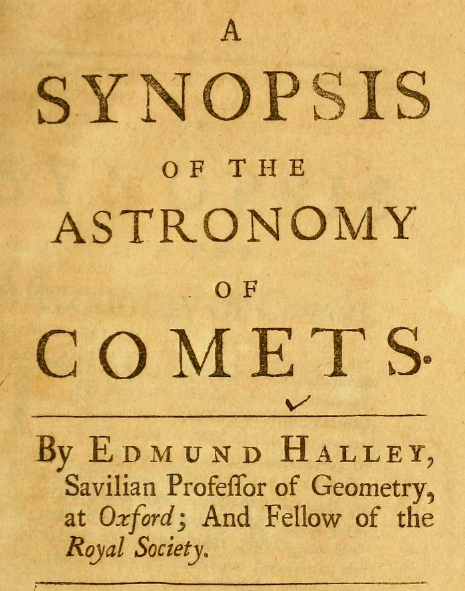 Title page of Halley’s Synopsis (London, 1705). Somewhere out there in the homeschooling community there is a future astronomer, physicist, or mathematician ready to follow in Halley’s footsteps. By introducing your own students to the great works of the past you make it possible for them to develop their own vision for what they may be able to accomplish in the future. ❡ Explore more: For a quick review of the Scientific Revolution, in which Edmond Halley played an important part, turn to page 266 in your River Houses history encyclopedia (riverhouses.org/books). It’s just the background you need for a wonderful homeschool history of science lesson.